Photos taken on April 23, 2005. TexasFreeway.com will have a comprehensive report on the trip to the burned out bridge and the search for the lost city of East Orange, Louisiana. In the meantime, here is a sneak peak of what we found. 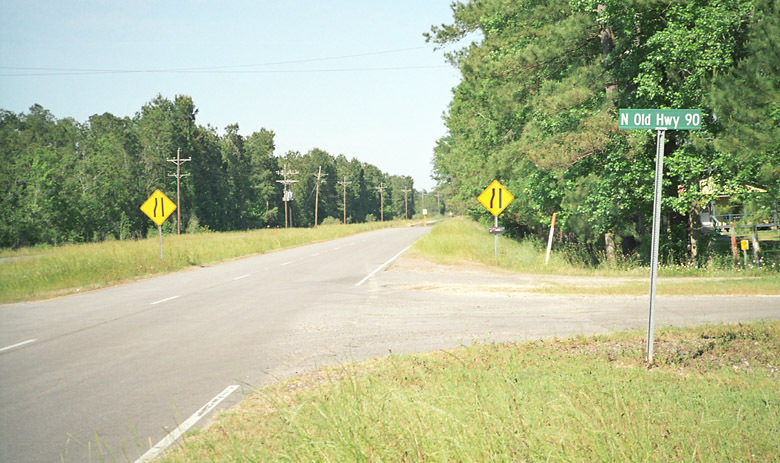 Old US 90 was the east-west route prior to the construction of Interstate 10. It crossed the Sabine River at Orange, TX, leading directly into the center of Orange. 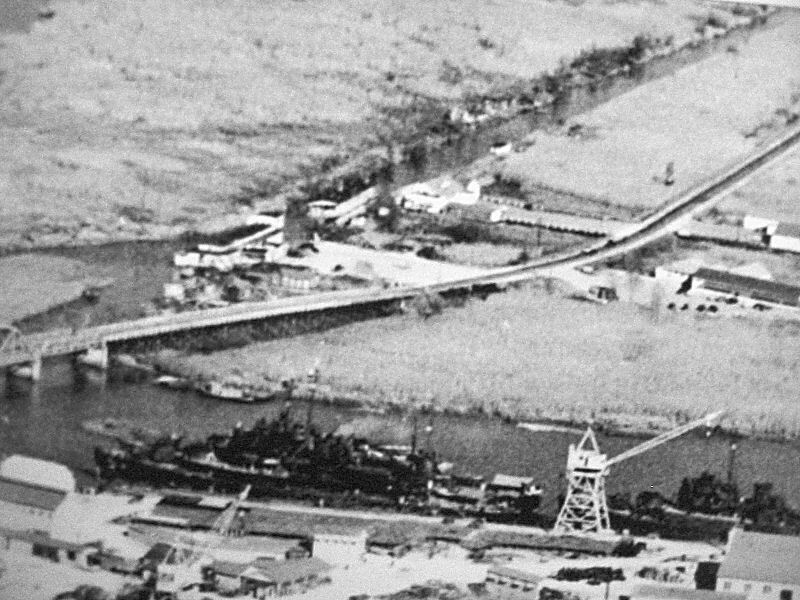 The Sabine River bridge was a mechanical design to allow the passage of vessels (rotating swing bridge, I think). Just east of the Sabine River in Louisiana US 90 traversed through a swampy area and featured a long timber bridge, approximatly 1 mile long. 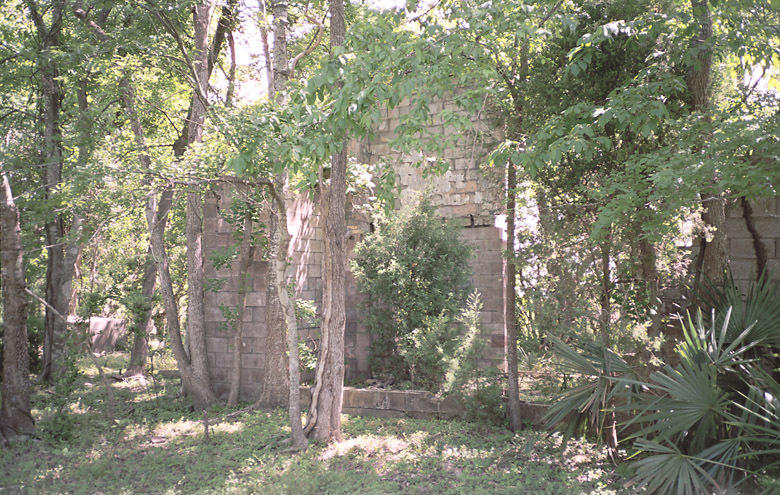 Directly across from Orange, Texas, a few structures were constructed along the highway and the area was informally called East Orange, Louisiana. The Interstate 10 bridge over the Sabine River opened circa 1954, rendering the original US 90 as a secondary route. 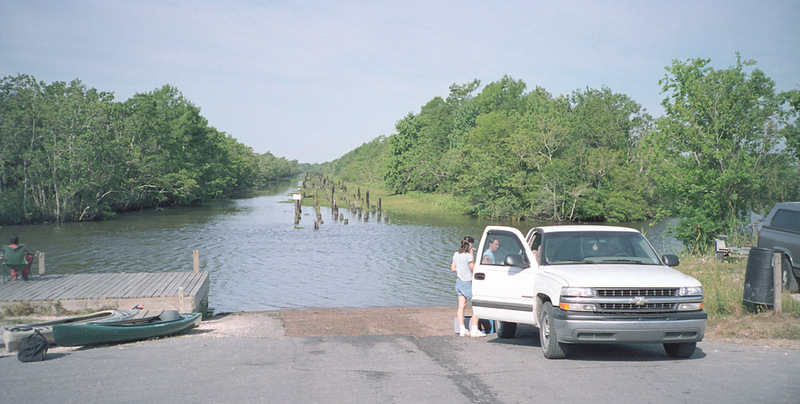 In the 1960s the Sabine River bridge was removed, making the old US 90 a dead end. In 1973, the timber bridge burned. According to local legend, a suicidal person had a grudge against the highway department so he set both ends of the bridge on fire and parked his car in the middle. Whatever the real story, it is believed that the fire was set. 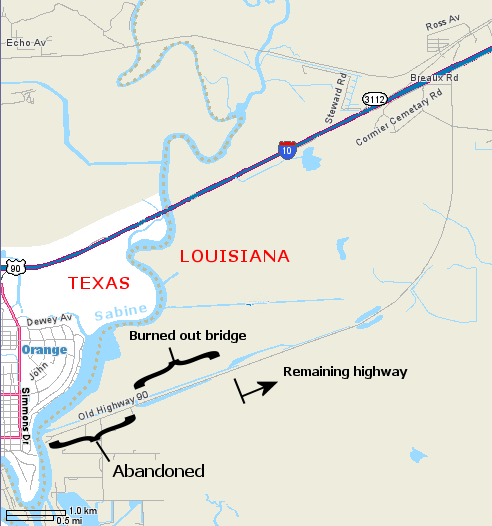 The burning of the bridge isolated a section of highway between the bridge and the Sabine River. It became an abandoned highway. The end of the accessible highway east of the burned out bridge is now a boat launch into a canal. 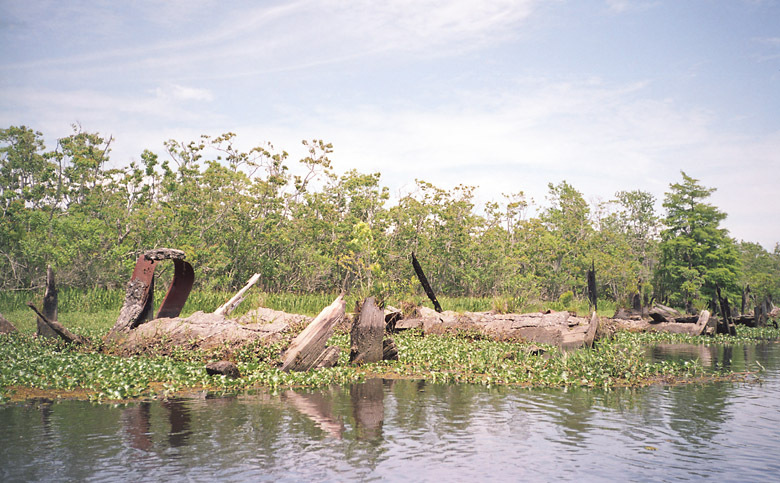 We used kayaks to reach the abandoned highway and then searched for remains of the structures. There wasn't much left of the structures. The abandoned highway and burned out bridge are in Louisiana just across from Orange, TX. 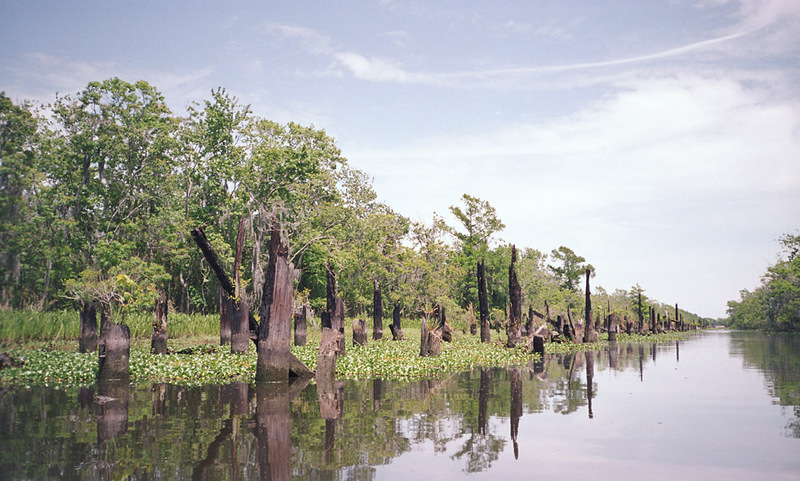 This is a view of structures at East Orange, Louisiana, looking northeast. Unfortunately I don't have a date on the photo. 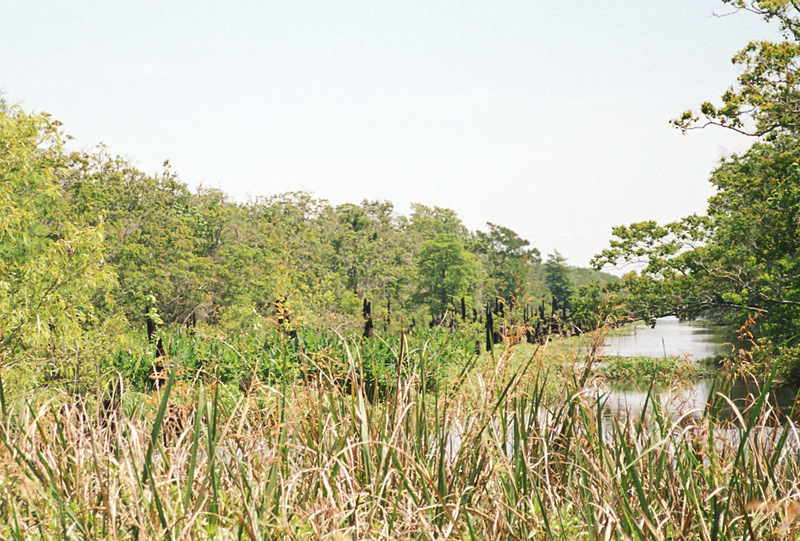 The land in the foreground is Texas, and the other side is Louisiana. 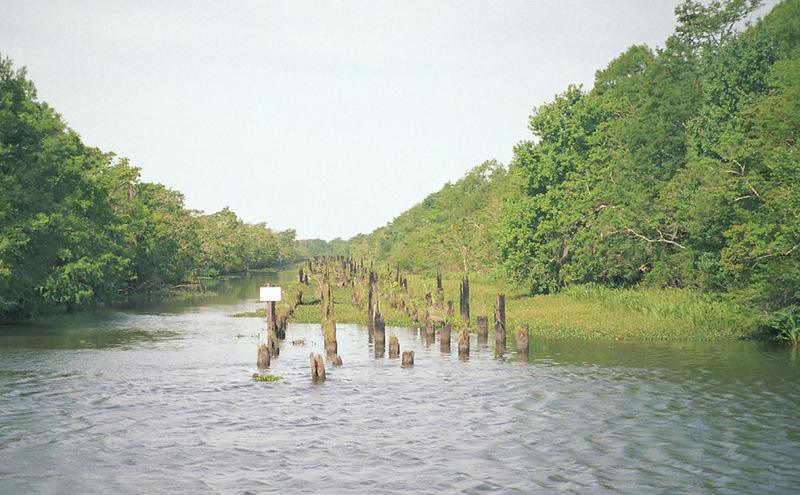 The old US 90 crossed the Sabine and proceeded eastward to the bridge, which is now the burned out bridge. It looks like the Louisiana side was mostly clear land. Today, it is mostly wooded. The area where the structures were is fully wooded. This is where the section of Old US 90 begins on the north side of Interstate 10. Old US 90 doesn't cross Interstate 10 - it stops on both sides of the Interstate. There is a boat ramp at the end of the road. In the distance, the charred piers of the burned out bridge can be seen. This is a closer view of the bridge piers. 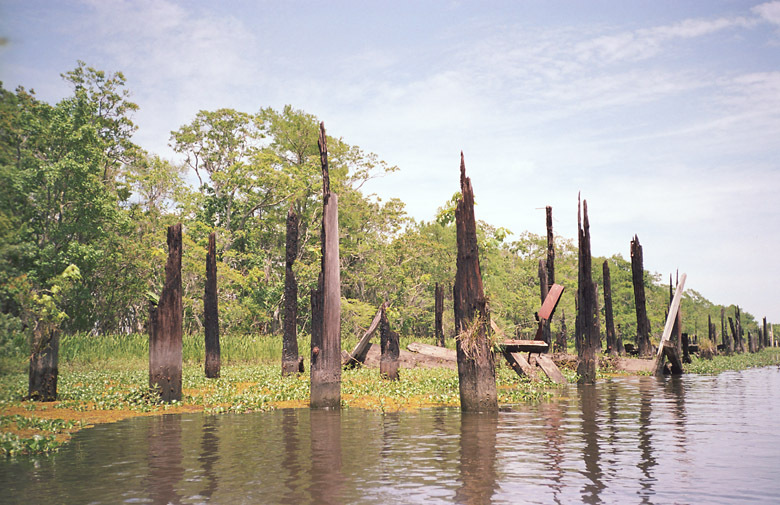 This is a view of burned out piers from the kayak. 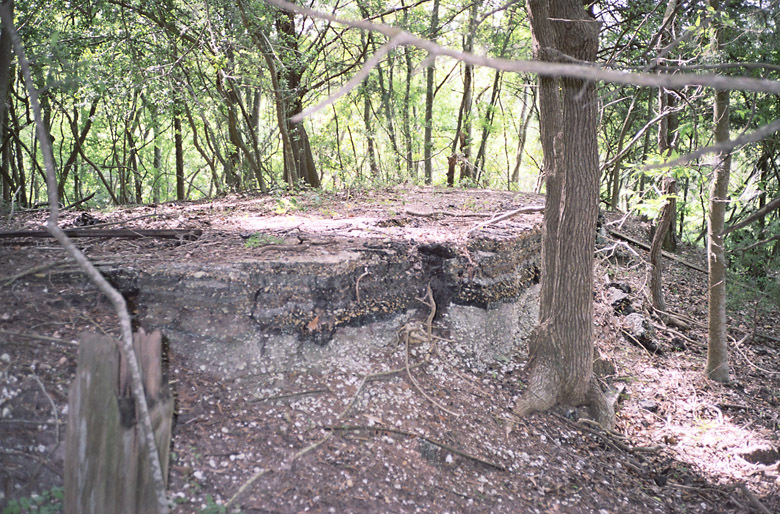 This view shows the remains of the bridge deck with its asphaltic coating. This view looks east from the west end of the burned out bridge. 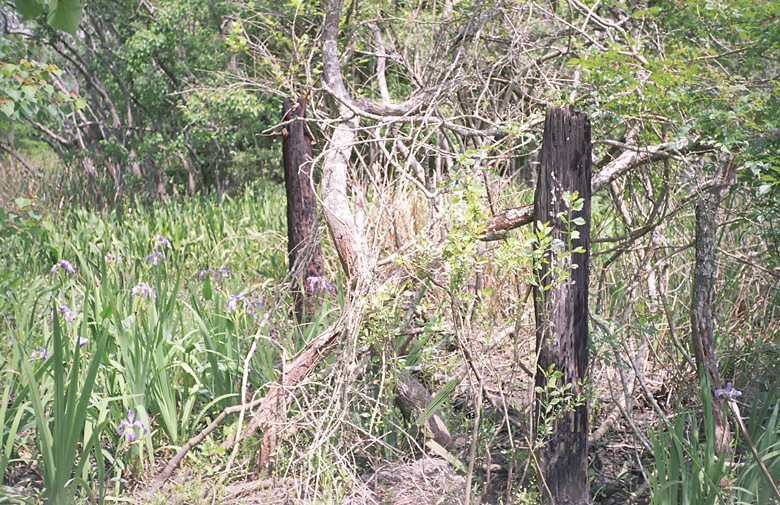 Some black piers can be seen in the brush. Here are two charred piers at the western bridge landing. Between the western bridge landing and the Sabine River, the highway is abandoned. 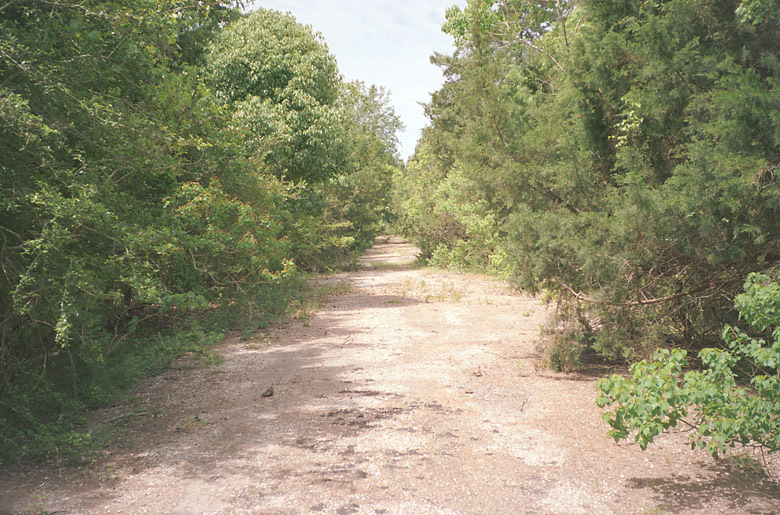 This is a typical view of the abandoned highway. The asphalt is still in decent condition, but the brush has formed a canopy over the highway in many places. 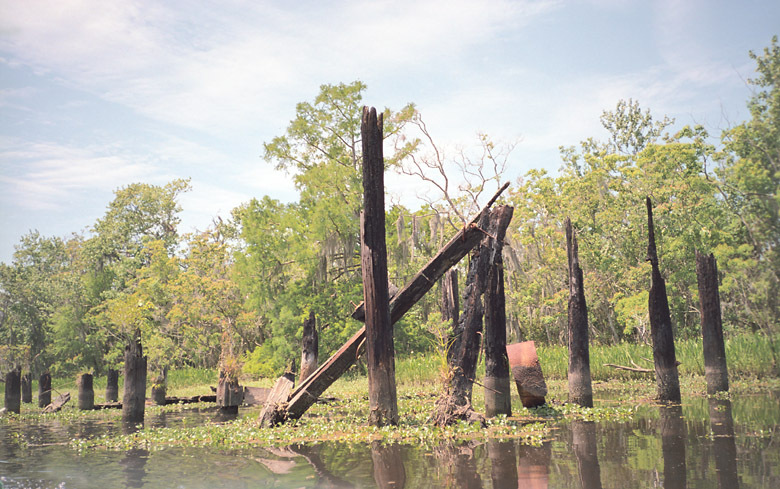 Not much remains of the former East Orange, Louisiana. This is the only ruined structure we found. Elsewhere we found footings of other structures. This is the end of the highway at the Sabine River.